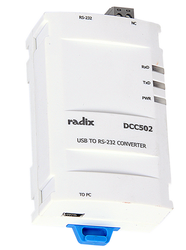 The new Serial To Ethernet Converter DCC201 from Radix connects any Serial Device (RS232, RS485) to an Ethernet network in minutes, including Serial Modbus to Modbus TCP/IP over Ethernet. DCC201 is an industrial grade converter designed for use in harsh industrial environments. It will work in the presence of electrical ‘noise’ as well as in high temperature and humidity. The DCC201 uses one of the most powerful and fast microprocessors available for such products. DCC201 accepts a dynamically assigned IP address from a DHCP server on your network. This DHCP client capability makes this Serial To Ethernet Converter very simple and easy to use on any nearly any Ethernet network. The DCC201 Serial To Ethernet Converter can be used to make any serial device into a node on an Ethernet network. It will have a unique IP address that allows it to be accessed from any authorized computer on the LAN, WAN or Ethernet. The Serial To Ethernet Converter DCC201 converts the serial data into standard TCP/IP packets that can travel over any Ethernet LAN and the Internet. DCC201 is compatible with a wide variety of industrial as well as commercial serial devices. These include : vending machines, time clocks, security alarms, telecommunications equipment, cash registers, card-key access controllers and bar-code readers; as also PID Temperature Controllers, Data loggers, Flow Indicators / Totalizers, PLCs, Humidity Controllers, Weighing Instruments, Energy Meters and other Process Measurement and Control instrumentation. DCC201 also finds wide usage in SCADA systems, Data Acquisition Systems, Control Panels, Energy Monitoring & Power Station Load Management and many more applications. DCC201 is compatible with wireless Ethernet. Where cabling is not possible, DCC201 can be connected to a Wireless Ethernet Access Point, providing simple & economical wireless connectivity for serial devices. 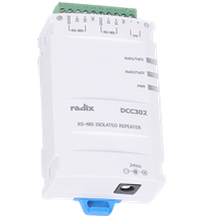 Radix also provides an OEM PCB version of the Serial To Ethernet Converter, DCC203, powered by a 10 to 50 V DC / 100 mA supply. OEMs can incorporate this into an existing product with a serial interface, thereby adding Ethernet/Internet connectivity. Radix can also design a PCB to match the customer’s space/mechanical requirements. For private labelling of DCC201 as well as the OEM version DCC203, the web-based configuration utility will also be customised to reflect the name and logo of the customer. Contact Radix for OEM and private labelling requirements. The DCC503 USB to HART converter is used to configure a variety of Radix HART Temperature Transmitters and other instruments. It connects to a USB port in the PC. The PC port is isolated electrically from the instrument. No external power supply is required. USB A-type female to USB miniature B-type female cable provided for easy interfacing with PC and converter. Din rail & surface mount. DCC202 is an interface i.e a serial to ethernet converter between an RS232, RS485 & RS422 bus and an Ethernet port. The web-based configuration utility allows the host IP address and serial settings to be changed. The DCC202 module offers true IEEE 802.3af-compliant (classification, Class 1) Power Over Ethernet (PoE) functionality using a standard category 5 Ethernet cable to receive power from a PoE switch such as the FS108Pv3. If there is no PoE switch on site, the module will also accept power input from a DC adapter. Windows OS & Web based configuration utility. 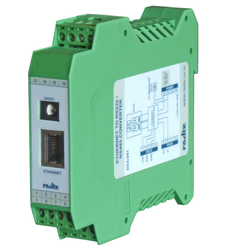 DCC203 is an interface between an RS232, RS485 or RS422 bus and an Ethernet port. It converts between MODBUS TCP & MODBUS RTU. It has multiple master access on a single Ethernet port. This allows upto 12 masters to access the same devices on the serial bus. The browser based configuration utility allows the host IP address & serial settings to be changed. The DCC203 module offers true IEEE 802.3af-compliant (classification, Class 1) Power Over Ethernet (PoE) functionality using a standard category 5 Ethernet cable to receive power from a PoE switch such as the FS108Pv3. If there is no PoE switch on site, the module will also accept power input from a DC adapter. 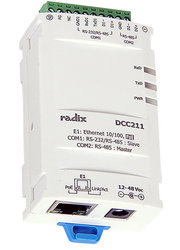 DCC211 is a Serial-to-Ethernet converter. It is an Industrial Terminal Server which functions as a gateway. It has two serial ports (RS232/RS485 slave, RS485 master) and an Ethernet port (master). It finds applications where a SCADA software, a PLC, an HMI or DCS need to communicate with a serial bus (RS232/RS485).For example, a SCADA software running on a PC is connected to the Ethernet port as master & an HMI is connected to the RS485 port as the second master. Both masters are able to access data from up to 32 devices on an RS485 bus, example - temperature scanners, connected to the RS485 port (slave) of the DCC211. 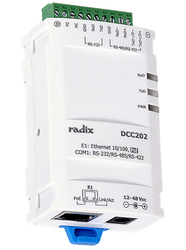 DCC211 is an interface between an RS232 or RS485 bus and an Ethernet port. It converts between MODBUS TCP & MODBUS RTU. The web-based configuration utility allows the host IP address & serial settings to be changed. The DCC211 Converter offers true IEEE 802.3af-compliant (classification, Class 1) Power over Ethernet (PoE) functionality using a standard category 6 Ethernet cable to receive power from any PoE switch. If there is no PoE switch on site, the module will also accept power input from a DC adapter. The RS232 to RS485 / RS422 converter allows the interface of any device using an RS232 serial link to an RS485 /RS422 link. 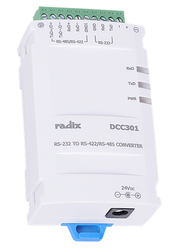 The DCC301 converter also provides optical isolation between the RS232 & RS485 or RS422 connections. This ensures that any abnormal voltage on the RS485 or RS422 bus does not affect the RS232 port (say of a PC). The RS485 bus can be upto 1200 metres (4000 feet) long. 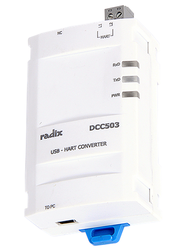 The DCC301 converter supports baud rates upto 115200 bits/second. The DCC501 USB to Serial converter is used to configure a variety of Radix Temperature Transmitters and other instruments. It connects to a USB port in the PC. The PC port is isolated electrically from the instrument. No external power supply is required. Drivers provided for Windows 95/98/ME/2000/ XP/2007. DCC601 is an IP based Ethernet I/O Module for monitoring and controlling applications. It can be operated over a LAN and has a variety of Input/Output functions. The module can be remotely controlled through a 10/100 M Ethernet network using the MODBUS TCP protocol. MODBUS is the de facto standard communications protocol, and is now the most commonly available means of connecting industrial electronic devices. This makes DCC601 ideal for integration with HMI, SCADA, PLC and other software systems. It has 2 opto-isolated digital input ports which can be configured as digital inputs (eg limit switches), counter inputs (eg flowmeter pulses) or frequency inputs. It also has two opto-isolated digital output ports which can be configured as digital outputs (eg to operate a relay) orPWM outputs (eg to generate a variable voltage). Digital outputs are open collector type with 100mA sinking capacity for each channel. 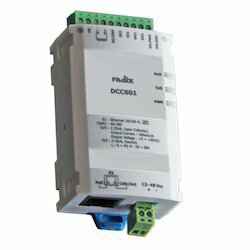 DCC601 reads digital inputs and writes digital outputs either from a local web page or by using MODBUS TCP on SCADA software. It also has an RS485 port which is used to convert MODBUS TCP to MODBUS RTU protocol. DCC601 supports MODBUS TCP Client / Server protocol. DCC601 has a pairing function. This allows one DCC601 to be paired with another DCC601, or any other equivalent instrument of another make. After pairing, the input of the first instrument is recreated as the output of the second. DCC601 offers true IEEE 802.3af-compliant (classification, Class 1) Power Over Ethernet (PoE) functionality using a standard Category 6. Ethernet cable to receive power from a PoE switch such as the Netgear model FS108Pv3. If a PoE switch is not available, the module will also accept power input an external power supply (12 to 48 VDC). The DCC302 is an optically isolated RS485 to RS485 line repeater that can be used to isolate a piece of equipment from the rest of the network. As a repeater, it extends the distance of an existing RS485 network an additional 1.2 km (4000 ft). Data signals and the power inputs connect to the terminal block. The repeater operates on an external 18~36 VDC power supply. The enclosure can be easily mounted on a either standard 35mm DIN rail, and/or also surface mounted. Looking for Converter and Communication Products ?